Today's guest post is by Toby Lloyd, Head of Policy at the housing and homelessness charity Shelter. It explains how we can cut the £22bn spent on housing benefit. The main reason why it's that high is because of the high cost of rent caused by this country's housing bubble. If we build more homes we'll bring down the overall cost of housing, and therefore bring down the housing benefit spend. We already know we can afford to build more houses: that £22bn housing benefit spend is around twenty times more than we currently spend on building affordable homes. We'd actually end up saving money. So why is the government pumping a further £80bn into loans, including mortgages, which will keep the housing market overpriced? Housing charity Shelter says "Let's spend less on housing"?! The news has been worryingly free of house price stories of late, forcing some papers to fill pages with minor distractions like the Olympics, Leveson and the great summer weather. Thankfully the IMF has come to the rescue of editors everywhere, with its annual report on the UK economy suggesting that house prices still need to fall by 10-15% now-ish – and by up to 30% to get back to trend. Inevitably, the response from some quarters will be for the Government to do something, which always comes with a price tag. With budgets everywhere being slashed, you don’t get many charities calling for their patch to be cut. We tend to make the case for why our bit should be spared the axe. But I reckon we should be spending far less than we currently do on housing ourselves as a nation. Firstly, there’s the fact that we spend £22 billion a year on housing benefit – about twenty times what we spend on building affordable homes. As we’ve argued before, this is a ridiculous state of affairs – but you won’t fix it by cutting housing benefit for those who have the temerity to be unable to afford sky-high private rents. You fix it by ensuring more people don’t need benefit just to keep a roof over their heads, which means building more affordable homes, and by making the homes we already have more affordable. Calling for more public investment into home building runs straight into the arguments about whether more public borrowing is a good idea (it’s cheap right now, there’s lots of spare capacity and unemployment) or economic and political suicide (there’s a public debt crisis out there, polling shows the public support deficit reduction). So the consensus seems to be that we need more private investment – and more private borrowing. On 5 July there was a further £50bn of quantitative easing, then a few weeks later the new Funding for Lending scheme was launched, promising to pump £80bn of credit into loans, including mortgages. And this is where it gets worrying. What both sides of the debt debate ignore is the fact that private debt is still astronomically high. More borrowing for productive enterprise – i.e. to create real growth – may be needed, but mortgage borrowing doesn’t do this. 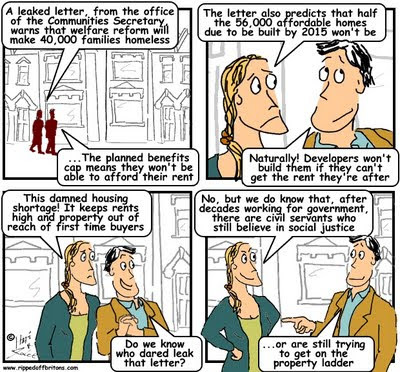 As this natty animation below shows, most of it goes into inflating the price of existing homes – ensuring that all those rentysomething wannabe first time buyers remain priced out for good, unless of course they have family rich and generous enough to help them. Do we really want to go back to a model of property ownership based strictly on inheritance rather than earning? The cunning plan to pump more credit into mortgages seems more orientated to promoting a new house price boom than stimulating economic growth. When our housing costs are already the third highest in Europe, why should we want to make it worse? The IMF report also shows that UK household debt is the highest in the G7 at over 100% of GDP – and the vast bulk of that is mortgages. As the IMF pointed out in April, the countries that are suffering the worst recessions are those that built up lots of household debt though housing bubbles. The new report includes some truly scary graphics on p23 of the role of the housing market in our current economic woes. So there you have it: we need to spend much less on buying homes in future – not only would this enable us to spend the money on growth-fuelling investment, it might even allow us to buy, rent and build more homes without busting the bank, literally. You point out an answer which doesn't get to the main problem. Immigrants, both EU & world immigrants. They use up our housing, NHS, Schools, benefits and ruin the national pride we once had. If half the estimated immigrants were returned to their origin and jobs given to the UK residents, we would have more than enough housing stock, smaller classroom sizes, decreased demand on the NHS & a reduced benefits bill. Lord Lindley. Lazy answer of "immigrants". Usually from Daily Mail Readers. In thirty years, Population increased by 5%. Not exactly explained by immigration. While I liked your animation explaining why the housing market is broken I feel it would benfit greatly from the introduction of the past tense. The section about the 1990s is unnecessarily ambiguous and requires great attention by the viewer which would not be necessary were the tenses more closely attended to. Is/Was. Does/Did. Has/Had. Are/Were. It's not rocket science. It used to be known as good English. Don't say the 'Hellraker' person above has failed to spot the immigrants living all around him, in houses, usually council ..houses. The immigrants living next to me bought their house, as did the ones three doors away. The only council house now, next to me is occupied by an unmarried mother from this town on benefits. The problem is that parties only back housing when it is not near them! They are making week promises that will never resolve the issue. Ed Miliband has promised 200,000 house when their are 243,000 new household formed every year! This will mean mean 43,000 more people competing for the same homes; so expect rents to go up! Ed Miliband has also been doing interview with CPRE and stating that he will add additional planning restrictions that will slow down the growth in numbers of new homes! His priory is not housing or the poor! If only labour would back a real house building program. But that would upset thier grassroots so is definitely off the cards!